Westminster resident Christopher Martin, a 2011 graduate of Carroll Community College, was the student speaker during Carroll's Commencement ceremonies at McDaniel College on May 25, 2011. Martin was selected to speak because of his classroom and campus involvement, including serving as president of the Student Government Organization. 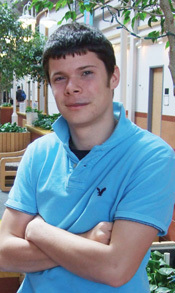 Martin, a Hill Scholar, was also a member of the soccer club and the Campus Activities Board. "Christopher is a fine, well-rounded student who was an inspiration to his fellow students," said College President Dr. Faye Pappalardo. Martin majored in business at Carroll. He plans to transfer to Salisbury University and major in International Financial Investing. "I have quickly reached the end of my journey at Carroll. I have grown more in these last two years than I ever imagined," said Martin. "With the support of the spectacular faculty, and through classes and my peers, I will be forever influenced by my experiences at Carroll."